In 2011 my mentor, an atheist anarchist lawyer of Jewish descent, passed away. His widow gave me some of his old documents and a collection of 42 dress shirts that he wore as a professor. This collection of men’s dress shirts, all of which are blue except for three, were the uniform of this man over the course of his career which began in the late 1960s. In utilizing the shirts of such a man, can I then absorb some of his power and position? Are there the remnants of his persona left in the materials he left behind? 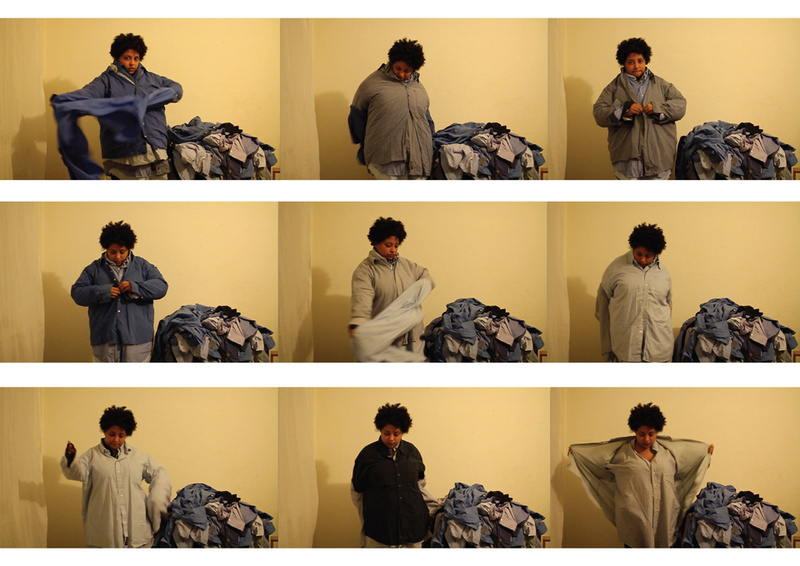 In this work, I wear all 42 Shirts and begin, with the assistance of another, to remove each layer. Once I regain partial mobility, I will continue to remove the shirts alone until none remain. The only sounds are the result of my struggle to remove each layer of clothing. Costumes contain a certain power and playing dress up or wearing one for a holiday allows the person to take on the persona. Uniforms, as they are, retain a certain power and establish the wearer within the roles they live. Pilots are evident in their status in their form of dress, garbage men are easily identifiable when wearing their jumpsuits throughout the city. Clothes allow us some control in projecting the image of ourselves and how we would like to be perceived. We change our clothes according to custom and assimilation. But clothes also protect us from society’s perceptions of us. We choose clothes to conceal or reveal not only the physical changes to our bodies as we age, or gain or lose weight, but also clothes are like second and third skins that shield our individual selves. Each shirt that I remove is covering one from before, and is a reminder of our many selves and of our many phases and roles in life.